The policies and bylaws of Eliot Unitarian Chapel can be found on the Policies and Bylaws page here. Interested in attending an Eliot Chapel Board of Trustees meeting? Click here to review Board meeting visitor information. Click on the link below to view the next Board meeting agenda. To see minutes for older meetings, please contact the church office at frontoffice@eliotchapel.org. See the current report at the right. For older reports, please contact the church office at frontoffice@eliotchapel.org. The Board of Trustees is responsible for establishing, amending, interpreting and enforcing Chapel policies in accordance with the by-laws. The Board also delegates responsibility, authority and accountability to the minister and board committees. The Board is composed of seven members who are elected by the congregation for staggered three-year terms. The Lead Minister is an ex officio, non-voting member of the board. The Board meets the second Tuesday of the month at 7:00 pm in Adams Hall. Meetings are open to anyone in the Eliot community. L to R: Cathy Converse, Brian Kripner (Chair Elect), Rev. Barbara Gadon, Jon Spiesman, Karen Fuchs, Ken Denson (Treasurer),Todd Stark (Chair), Trina Priese (Secretary). create a more just society, further dismantle racism, and improve the environment. We aim to make a positive difference within, among, and beyond ourselves. Rationale and background on the Mission and Vision can be found in the following white paper. Click here to read a white paper on the development of the 2016 Ends Statements. Click here for an interpretation of the Ends Statements. Click here for the Ends Monitoring Report. 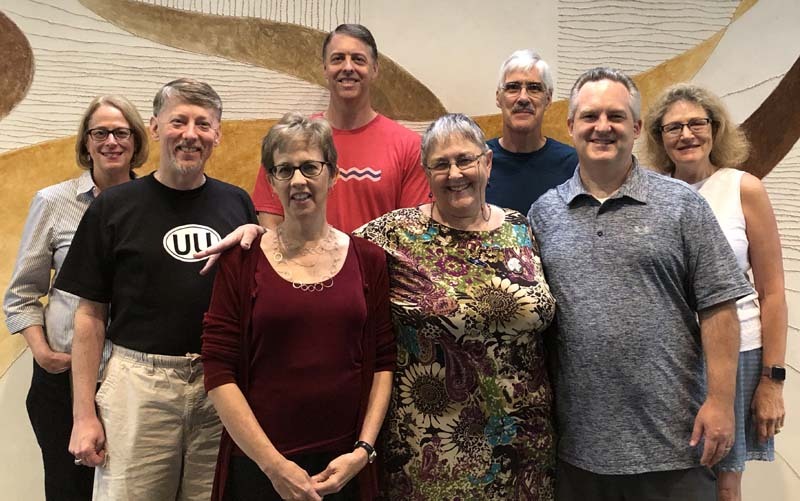 Article V of the By-Laws of Eliot Unitarian Chapel directs the the Board of Trustees to use a policy governance model to provide general direction. Policy Governance defines and guides appropriate relationships between an organization's owners, its Board of Trustees, and its Chief Executive Officer (in our case, Lead Minister). It provides a clear differentiation between means and ends responsibilities. The board exists to properly empower others, which means to define the results to be achieved by the organization (ends), and define what would be considered unacceptable in terms of ethics and prudence (executive limitations). The board delegates the job of achieving its ends within the parameters defined in policy to the Lead Minister. To complete the delegation, the board regularly monitors performance to uphold accountability of the Lead Minister. Click here to read questions and answers about policy governance. Below are documents intended to keep the congregation abreast of some of our significant activities over the past few years. February 2013: What is the Purpose of the Church? To see older Board Bits, please contact the church office at frontoffice@eliotchapel.org.